Check out our top picks for fall as we look forward to cooler seasons of sewing! Now that we're in the middle of a 100 degree heat wave, is it safe to start dreaming of fall? We think so! We're looking forward to cooler sewing seasons ahead with new fall projects and fabrics. It's never too early to start thinking of Halloween at my house. My youngest son starts planning MONTHS ahead. Every April (yes, APRIL!) he jumps for joy when a certain costume catalogue arrives in our mailbox. He pours over it circling every option; a dragon, an astronaut, a knight in shining armor... Batman always gets a circle and my favorite, a gold-lame' cobra. That last one however, is not my wallet's favorite so it's still just a dream. He guards that catalogue until he has made a decision (usually by early August) then begins the search for all the right accessories. He'll change his mind a few times (late October) always keeping things exciting for mom. Then when the big day finally comes he assumes his character's role 100%. Now comes the question, do I sew all of his costumes? Nope. I've sworn off the costume sewing (thank you catalogue!) but I do plenty of fall stitching with quilts and wool applique! 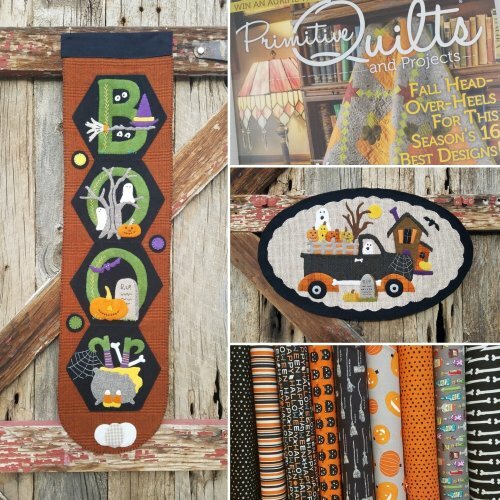 Here are a few of our top picks for fall sewing: Two darling wool applique projects from Buttermilk Basin; the Hexi Door Greeter for October and a Vintage Truck for October featuring ghosts, pumpkins, bats and more haunting fun. The latest issue of Primitive Quilts magazine is hot off the press and boasts a fabulous pumpkin quilt right on the front cover that is calling my name. And we are LOVING the Cats, Jacks & Bats fabric collection by My Mind's Eye for Riley Blake. Each witches broom has a clever model name and those tiny potion bottles are clearly labeled! 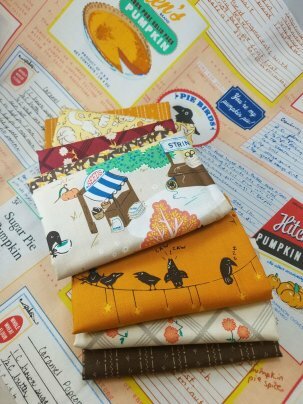 If you're looking for fall fabric that doesn't scream Halloween, we have just the thing! Calico Crows by Lauren Nash is a fabulous fall collection that just came through our door. That recipe card fabric is to-die-for! Look close at the coordinates and you'll find pumpkins for pie, scurrying squirrels, crows (caw caw! ), calico florals and cute fall market stands. It's a perfect pattern for showcasing large-print fabrics such as these from the Bohemia collection by Dena Designs of Free Spirit Fabrics. 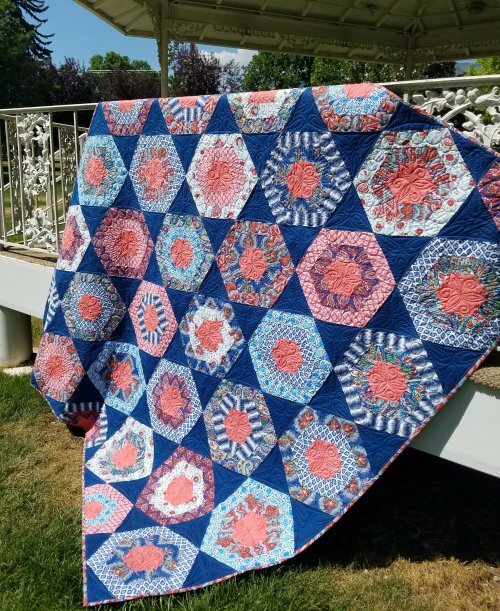 Chris Chamberlain did a lovely job piecing and machine quilting this bold beauty! We have kits! July 16th - 25% off MINKY including all regular price Cuddle and Minky yardage, Cuddle kits and pre-made Cuddle quilts! Friday, August 10th 10 a.m. - 11 p.m.
Saturday August 11th 10 a.m. - 7 p.m.